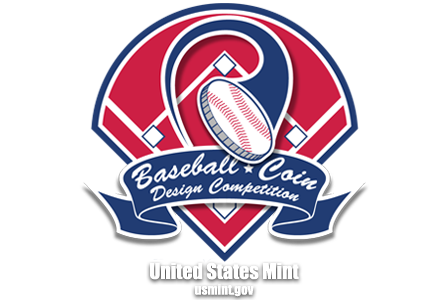 A Hand Full of Gold | Baseball Coin Design Competition: Batter up! Pitch your coin design today. Built upon the value of community, Baseball is the backbone of American culture. Raised loving the native pastime, a glove assisted me not only as a tool, but helped foster communication and trust between my family and peers. It is a fundamental symbol for teamwork and camaraderie. The shape of the glove also highlights the concavity of the coin. Two wheat sheaves unite with the braided lace of the glove to form a ring. This stands for American unity, stitched together to form one nation. The wheat celebrates a love for our bountiful land and home. Out of all the designs, this one is my favorite. However, the positioning of the date and "In God We Trust" should be moved. Otherwise, I love this design above all the others. Of the 26 here, this one is by far the best. It PERFECTLY compliments the other side of the coin with the concave nature! Congratulations on your design not only being selected as one of the 16 finalists, but also recommended today, July 18, by the Commission of Fine Arts as THE design to which the Treasury secretary should give final approval. Trying to reach you to conduct an interview about the recommendation. I can be reached on my cell phone at 937-489-1887, or work number at 937-498-0855. If I don't pick up, leave a phone number or email where you can be easily reached. Thanks. COIN WORLD contains news coverage on U.S. and world coins, tokens, medals, paper money and more! We offer something for the beginner, intermediate, and advanced collector, along with accurate and up-to-date prices of more than 50,000 U.S. coin values. After taking some time to really look at this design, I guess I have to agree with Coin World on this one. Nice design and well thought out (considering what is on the other side of the coin). I wish there was a bat somewhere, but the design holds it's own without it. Maybe a stylized eagle with shield (using a burned in leather look) as part of the center of the glove might be an idea, but I would think the artist already thought of that and rejected that concept as being too busy. Your design looks great! Congratulations. I hope this design wins. To me it compliments the other side and is well designed with composition and filling the surface of the coin. Kudos to the CFA for it's recommendation. I would gladly own the coins with this design on it. It looks hand drawn as well. Great talent. Thank you all so very much for your kind thoughts and suggestions. I am honored to be among this group of amazing artists!! Congrats, Cassie! 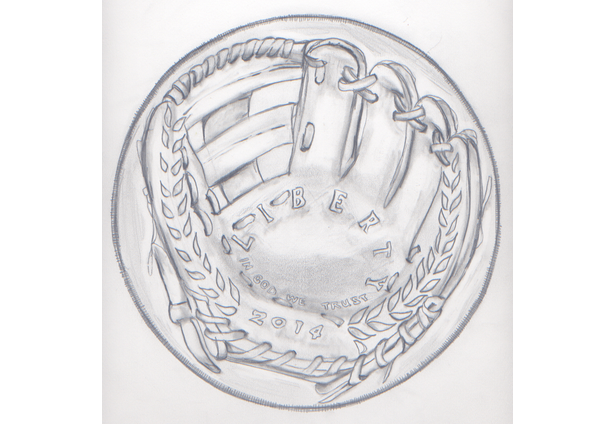 Yours is a smart design that will make for a very attractive commemorative coin, particularly with Don Everhart sculpting the art. Cassie, i write for CoinWeek.com. I'd like to touch base with you, if possible. email me at: htandcm105@gmail.com. Thanks.